The Design of the Wrigley Scoreboard: Revolutionary, Retro or Both? Wrigley Field got a lot of press last spring when it debuted the much-anticipated (or much-dreaded) mammoth-sized video board. On opening day, Cubs fans — some grinning, some grunting — feasted their eyes on 39,000 square-feet of instant replays, player stats, and pitch speeds. In other words, the works. But if you do the math, this Jumbotron and its right-field counterpart (a smaller screen that lists each team&apos;s batting lineup) didn’t add up to two ways to track games at Wrigley Field. It made three. Because, tucked in the back of the center field bleachers, sits the same, rinkydink hand-operated scoreboard that’s sat there for 78 years. And, amid Wrigley’s newfound displays of digital data, that old, middle board still makes an impression. “I was more struck by the scoreboard than the action on the field, to be honest with you,” says Tom Foust, whose Curious City question was inspired by his first and only Chicago Cubs game last season. 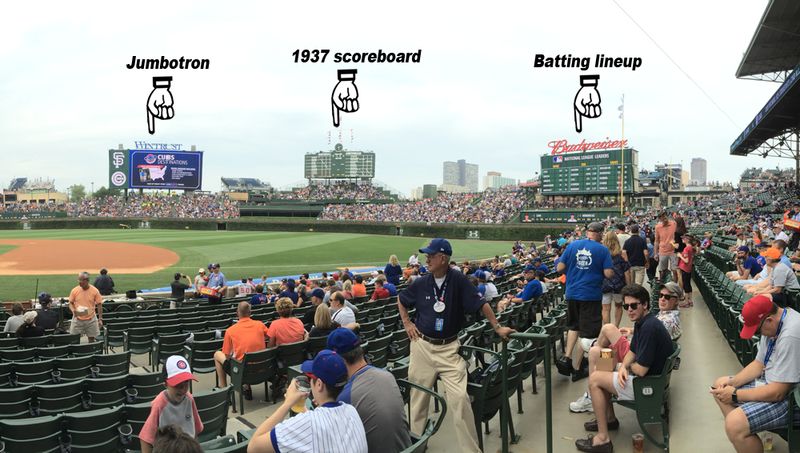 Was the Wrigley Field scoreboard a revolution in information design for 1937? Assessing whether a new technology amounts to a revolution is tricky. The cotton gin revolutionized agriculture, and television forever changed the way we consume entertainment. But what’s a scoreboard ever done? Or, as Tom wants to know, should this scoreboard join the ranks of the pie chart and the emoticon as a revolutionary piece of visual communication. For an answer, we delve into how the board was shaped, and we evaluate whether the design holds up today. And we get some extra-inning goodness: Regardless of its innovations (or lack thereof), the board tests the idea that everything old can indeed become new again. The story of the Wrigley Field scoreboard starts with a vision for the entire stadium. Philip Knight Wrigley inherited the Cubs from his father, the chewing gum magnate who ran the team as a hobby. 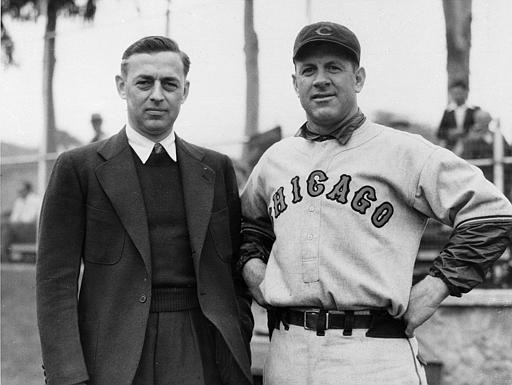 PK Wrigley promised to keep the Cubs in the family business, though, and was intrigued with the idea of filling seats more than actually running the team. In fact, PK Wrigley didn’t even like baseball. But being a man of marketing and aesthetics, Wrigley set out to expand Wrigley Field’s audience. In a redesign he first considered for the 1937 season, he wanted to attract new fans: women, children, and men more like himself. And the way to do it, he thought, was to make the place irresistible. Wrigley branded the place ‘Beautiful Wrigley Field.’ He advertised it all over radio stations and newspapers well before anyone ever set foot in the place before the 1937 opening day. He hired Otis Shepard, the famous corporate artist behind the success of Wrigley Gum, to reimagine the place with a soft, Art Deco flair. Together, they established the forest green and off-white color palette you see today, which was inspired by Wrigley Gum products and the baseball diamond itself. The outside marquee, the ticket booths, the concession stands were designed with noticeable intention. The scoreboard was to be the crown jewel that tied it all together. The left and right sides: The board displays scores from concurrent games running across the National and American leagues. While today it’s expected to be able to access the scores of games across the country (there are even dozens of baseball apps to choose from), Tom wondered if having all of that information accessible and displayed in 1937 was particularly revolutionary. Shea says … nope. Most big-league baseball scoreboards did have that information. Why? Baseball fans or not, people liked to gamble, and scoreboards that showed simultaneous games not only offered more options for where to place your bets, but also drew more people into ballparks. Verdict: This content was expected. Not revolutionary. ​The middle: The number of balls, scores, and outs (as well as other other doodads like the uniform number of the batters and umpires) are all displayed in the middle of the scoreboard. It’s run on a system of electromagnetic relays that control grids of small, painted eyelets (think of them as physical, manual pixels), that flip to form the numbers you see on the board. Relay technology was nothing new in 1937, but it hadn’t been applied to scoreboards before. As a result, though, the middle numbers are actually bigger than the manually-operated numbers displayed on the left or right, because the simpler technology worked with the push of a lever — not the work of, say, three men updating scores by hand. The larger numbers made the game easier to follow for new baseball fans. Verdict: The mechanisms are neat, but were actually common. Larger numbers are an improvement in user-experience, but not enough to make it revolutionary. Overall layout: Wrigley and Veeck were on to something when they decided to rethink the board&apos;s layout for the 1937 season. Most scoreboards at the time were either narrow and vertical, or narrow and horizontal. Veeck’s design arranged all of the scores in a large, rectangular shape and placed it above eye-level in the centerfield bleachers. Most other scoreboards were located at ground level near the infield, where not everyone could see it. Verdict: The new format was an improvement in designing a point of entry. At least it was at eye level and graspable at a quick glance. ​What to make of it all? 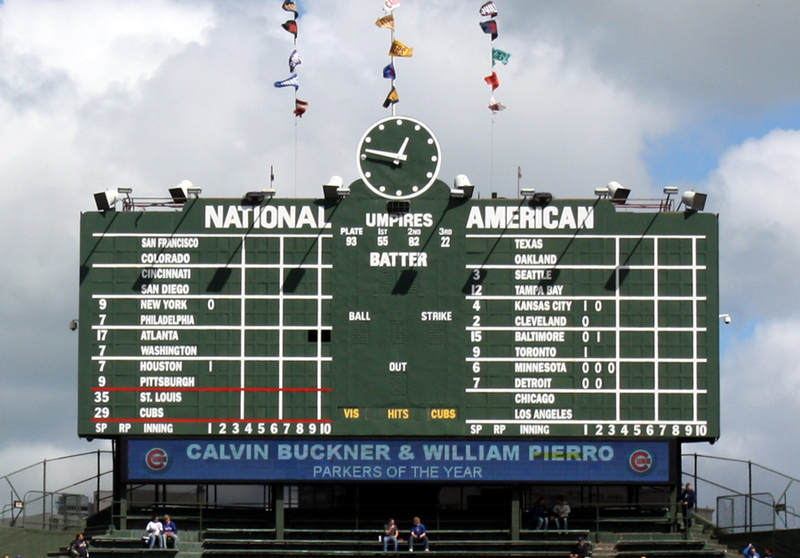 Here’s where we come down on it: In 1937, the Wrigley Field scoreboard was a hands-down improvement of the user experience, but, even with all of its improvements considered together, the board fell short of being revolutionary. But if it’s not revolutionary, what is it? The board’s survived several rounds of technological progress, including the streamlining of all-electric scoreboards during the 1950s. For that, it deserves some applause. But how does it hold up by today’s standards of technological interfaces? Marie Hicks, who teaches the history of technology at the Illinois Institute of Technology, is willingto provide her first impression: the classic Wrigley Field scoreboard is a mess. There’s just too much information, she says. It’s not user-friendly. There’s not a single point of entry. She’s confident that board wasn’t revolutionary, but not for the reasons you might think. Hicks says that for something to be revolutionary, it’s got to make a fundamental change in the way people do things from that point on. If it were revolutionary, the Wrigley scoreboard would have inspired copycats across the country. And in a broad movement towards mainstream replication, Hicks says, the original (the one at Wrigley) would lose value. It just wouldn’t be that special anymore. “If it were revolutionary then everything after it would have been just like it and there would have been less of a reason to keep it around,” she says. That’s not the case with Wrigley Field’s old scoreboard. In fact, the thing was special enough to receive landmark status from the City of Chicago in 2014. Which means, not only was the scoreboard decidedly worth historic preservation, it was also worth keeping up and running. Why? People love it. Even though the scoreboard was built in an era very different from our own, it’s still relatable. And Hicks says that relatability is key to understanding why the board was not so much revolutionary as it was a harbinger of an increasingly data-driven and information-rich society. One in which numbers pervade daily life and even entertainment. The Wrigley Field scoreboard, Hicks says, is one beautiful example of an early shift towards an world more like our own. That part where we see ourselves in the past ... That’s what nostalgia’s made of. Nostalgia, it turns out, can be quite the utility. Today, as Wrigley Field’s newly-installed Jumbotron hovers over left field, it could be flashing animated letters that tell you when to cheer, when to do the wave or when to kiss the stranger next to you. Instead, between the instant replays and inning wrap-ups, you see digitized films of Harry Caray at Wrigley Field singing “Take me out to the ball game,” or bits of Cubs history trivia — all digitally designed with the same, deep-forest green and off-white art deco details Cubs fans have enjoyed for decades. It’s as if the new video boards had the same art director as the old scoreboard. Although that old scoreboard ages by the day, it stays trapped in a twisted time warp, somewhere between old and new. A radical, retroactive anti-revolution. Tom Foust says when he sat in the Wrigley Field bleachers for the first time, his level of nerd-dom became utterly clear to him. “I am decidedly not a baseball guy, but I am a bit of an information nerd,” he says, adding that the Cubs game itself became kind of secondary. Tom has been spot-on when it comes to one observation: Yes, the Wrigley Field scoreboard is unique. But he was spot-wrong in the part about the Wrigley scoreboard encouraging the growth of more like it. In fact, learned that the Wrigley scoreboard is one of a kind, and that’s exactly what makes it decidedly non-revolutionary. But as a middle school music and technology teacher, he’s come up a follow-up question: How would a modern professional of information design create the same scoreboard using the technology of 1930? Well, Tom, we’ll leave that to your students to take up! Logan Jaffe is Curious City&apos;s web producer. Follow her on Twitter @loganjaffe.